The 2012 Harley-Davidson® Dyna® Wide Glide® FXDWG is full of classic chopper motorcycle style. New for 2012, the Harley Dyna Wide Glide features a new larger air-cooled Twin Cam 103™ Harley engine with 6-speed cruise drive transmission, providing more power for passing, hill-climbing, and riding with passenger and cargo. In front is a long and raked out fork with a 21 in. wheel, giving this model quintessential chopper motorcycle style. And in the back, the Harley Wide Glide features a side-mounted license plate for added custom chopper motorcycle style. Want even more factory custom style on your chopper motorcycles? This bike also features an optional classic flame design on the fuel tank. Select the flames on the Harley-Davidson Wide Glide chopper motorcycle for a factory custom look at an affordable Harley price. Learn more about the Harley Wide Glide or other Harley cruiser motorcycles like the Super Glide® Custom Harley-Davidson® and the Fat Bob® that has a big motorcycle feel. For a classic bobber motorcycle take a look at the Street Bob®. 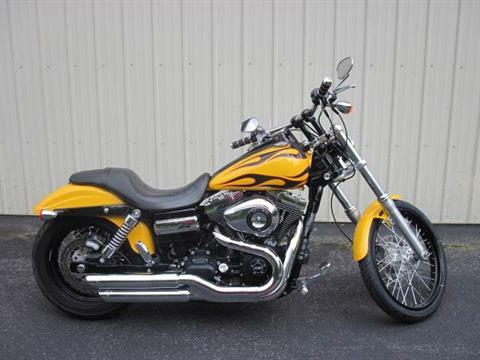 Check out all of the Dyna motorcycles and find a bike right for you.